The surgeon makes a small incision and inserts a thin vibrating probe to gently vacuum your natural lens out of the eye. A new synthetic lens is implanted to correct your vision. This synthetic lens is called an intraocular lens, or IOL (Figure 22). The IOL is folded up and inserted through the incision, and then unfolded and positioned in the eye. The incision is so small that it seals itself, so no sutures are needed. The entire procedure is painless and generally takes about ten minutes per eye. If you are farsighted, your natural lens is not strong enough. The surgeon removes your natural lens and inserts an IOL of stronger power to correct your farsightedness. Similarly, if you are nearsighted, the surgeon removes your natural lens and inserts a weaker IOL. Figure 22. 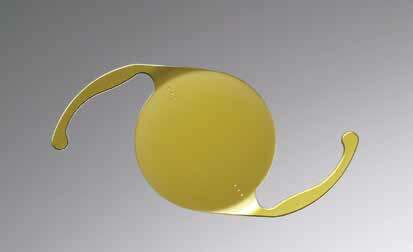 The photo above shows an intraocular lens (IOL), the synthetic lens that is inserted during a refractive lens exchange surgery. The two “arms” on each side of the lens hold it in place. Recovery is rapid—you can resume most of your normal activities the next day. Within a day or two of your surgery, you’ll marvel at how clear and vivid your world has become without glasses. In the hands of an experienced eye surgeon, refractive lens exchange is among the most effective and safe surgical procedures.